MARISA is structured in 8 work packages, over a duration of 30-months. MARISA end users practitioners are involved from the start WP2, contributing to the analysis of the context and the definition of the trials. Users also play a key role in refining the operational scenarios that drive the trials definition and in feeding the detailed analysis to be done of how the legacy systems are exercised during the trials. Users also play a key role in refining the operational scenarios that drive the trials definition and in feeding the detailed analysis to be done of how the legacy systems are exercised during the trials. This involvement is consolidated into user needs, which are then prioritised to create the functional, interface operational and security requirements as input to the MARISA ToolKit Design phase performed in WP3. The MARISA software development, integration and test activities performed in (WP4, WP5 and WP6) will exploit Agile software development processes supported by a continuous integration environment that eases the management of multiple contributions provided by the project partners in a geographically distributed productive scenario. A relevant integration and validation environment will be provided in WP6 to minimize the risk of toolkit deployment. Operational scenarios will be tested in advance in WP6 using simulated and real data. The MARISA Tooolkit will be operationally validated in WP7 according to selected scenarios. The validation will also include an assessment of the metrics and KPIs. Based on this approach, an overview of each WP is presented below, prior to the detailed definition of the WPs. will interact with all other WPs in order to ensure a successful project lifetime with respect to risk and innovation management. WP1 shows dependencies to all other WPs as it coordinates and ensures that the tasks are in line with the project work plan and performs scientific coordination as well, in order to reach the common goal of MARISA. animates the MARISA user community to foster pro-active involvement of stakeholders following a user-centric approach in the MARISA design and validation addressing user needs & requirements, user experience animation, legacy systems connectivity, co-creativity and collective trust building. The active involvement of the “end user practitioners”, partners and associates, is key to identify acceptability issues and societal impacts that proposed solutions may entail, and employs guidance to the partners and fosters interactions in the consortium for the implementation of the data fusion technologies. The interactions include the verification and validation during the operational trials. starts from user needs, use cases definition and identified interfaced/legacy systems output from WP2 to design the MARISA toolkit in terms of data fusion services, data models, internal and external interfaces and HCI. Existing human-computer-interfaces are analysed together with the end-users in the consortium and a concept for a MARISA-HCI is developed, taking existing HCIs into account but taking also into account the flexibility, semantic based approaches and advanced configuration options offered by the MARISA services to the end-users. The HCI’s role is key in easing the interaction of users with the MARISA toolkit but also empowering them to tune the services to their own needs. encompasses all the activities dealing with the Data Fusion computing capabilities of MARISA Toolkit. Referring to the JDL Data Fusion representation paradigm and the MARISA services presented in Figure 1, the first three Data Fusion levels will be addressed as part of WP4 development activities: Object Assessment, Situation Assessment and Impact Assessment while the level 4, User Refinement, will be part of WP5. aims at defining and developing the supporting infrastructure for the MARISA toolkit. It deals with the definition, implementation and set-up of the Big Data infrastructure, the development of the interfaces for the MARISA toolkit to exchange data from/to the external data sources, the development of the HCI services through which end users will interact with the toolkit, supporting the human-in-theloop paradigm, the implementation of Data Fusion distribution services by using a SOA approach (system-to-system interfaces) and the implementation of the Access Control services providing the capability to identify and authorize all individuals systems and users connecting to the MARISA Toolkit. goal is the integration and test of the MARISA toolkit on a reference platform to provide WP7 with qualified systems to support the trials. The various components of the MARISA system coming from WP4 and WP5 will be integrated and validated the configuration. External interfaced systems will be simulated/emulated whenever not available. will demonstrate and validate MARISA services in operational trials. Five operational trials will be defined according to the operational scenarios defined in WP2 involving end-users and interfacing existing systems/legacy systems. will obtain inputs from all other WPs and ensures the communication and dissemination of results achieved within the individual WPs to the outside parties as well as to participating entities. 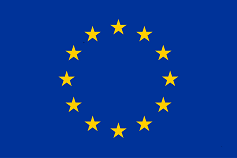 Furthermore, WP8 will support the partners to exploit the achieved results and impacts on the European and international market. Results within each WP will lead to contributions for standardisation measures, coordinated by this WP. 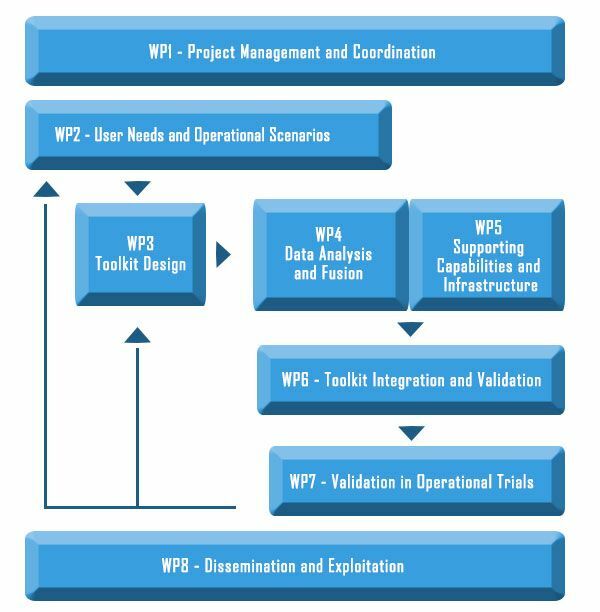 WP1 “Project Management and Coordination” will interact with all other WPs in order to ensure a successful project lifetime with respect to risk and innovation management. WP1 shows dependencies to all other WPs as it coordinates and ensures that the tasks are in line with the project work plan and performs scientific coordination as well, in order to reach the common goal of MARISA. WP2 “User Needs and Operational Scenarios” animates the MARISA user community to foster pro-active involvement of stakeholders following a user-centric approach in the MARISA design and validation addressing user needs & requirements, user experience animation, legacy systems connectivity, co-creativity and collective trust building. The active involvement of the “end user practitioners”, partners and associates, is key to identify acceptability issues and societal impacts that proposed solutions may entail, and employs guidance to the partners and fosters interactions in the consortium for the implementation of the data fusion technologies. The interactions include the verification and validation during the operational trials. WP3 “MARISA “Toolkit Design” starts from user needs, use cases definition and identified interfaced/legacy systems output from WP2 to design the MARISA toolkit in terms of data fusion services, data models, internal and external interfaces and HCI. Existing human-computer-interfaces are analysed together with the end-users in the consortium and a concept for a MARISA-HCI is developed, taking existing HCIs into account but taking also into account the flexibility, semantic based approaches and advanced configuration options offered by the MARISA services to the end-users. The HCI’s role is key in easing the interaction of users with the MARISA toolkit but also empowering them to tune the services to their own needs. WP4 “Data Analysis and Fusion” encompasses all the activities dealing with the Data Fusion computing capabilities of MARISA Toolkit. Referring to the JDL Data Fusion representation paradigm and the MARISA services presented in Figure 1, the first three Data Fusion levels will be addressed as part of WP4 development activities: Object Assessment, Situation Assessment and Impact Assessment while the level 4, User Refinement, will be part of WP5. WP5 “Supporting Capabilities and Infrastructure” aims at defining and developing the supporting infrastructure for the MARISA toolkit.It deals with the definition, implementation and set-up of the Big Data infrastructure, the development of the interfaces for the MARISA toolkit to exchange data from/to the external data sources, the development of the HCI services through which end users will interact with the toolkit, supporting the human-in-theloop paradigm, the implementation of Data Fusion distribution services by using a SOA approach (system-to-system interfaces) and the implementation of the Access Control services providing the capability to identify and authorize all individuals systems and users connecting to the MARISA Toolkit. WP6 “MARISA toolkit Integration and Validation” goal is the integration and test of the MARISA toolkit on a reference platform to provide WP7 with qualified systems to support the trials. The various components of the MARISA system coming from WP4 and WP5 will be integrated and validated the configuration. External interfaced systems will be simulated/emulated whenever not available. WP7 “Validation in Operational Trials” will demonstrate and validate MARISA services in operational trials. Five operational trials will be defined according to the operational scenarios defined in WP2 involving end-users and interfacing existing systems/legacy systems. WP8 “Dissemination and Exploitation” will obtain inputs from all other WPs and ensures the communication and dissemination of results achieved within the individual WPs to the outside parties as well as to participating entities. Furthermore, WP8 will support the partners to exploit the achieved results and impacts on the European and international market. Results within each WP will lead to contributions for standardisation measures, coordinated by this WP.